It just goes to show that great players can win playing in anything. These satorial crimes and misdemeanors vary between being victims of their time, slaves to fashion and downright bad. It all flowed from the hair really, so the party had to continue all the way down. Andre invented a new style of on-court wear and depending on your sensibilities, pulled it off in the late 80s and early 90s, but time is cruel and you won’t be seeing much denim and lycra happening unless you’re Serena Williams. The Worm is a bit of a fashion provocateur except nobody likes it. There are too many bad shirts to choose from so we picked his ‘referee shirt’ to make the point. 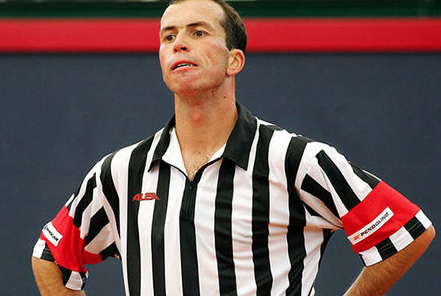 The only thing missing is a whistle. Maybe Dominik knew something we all didn’t? Perhaps there are sweat glands on your shoulder blades? Well, he must have thought so and somehow strong-armed his clothing company into manufacturing it. One of life’s eternal mysteries. 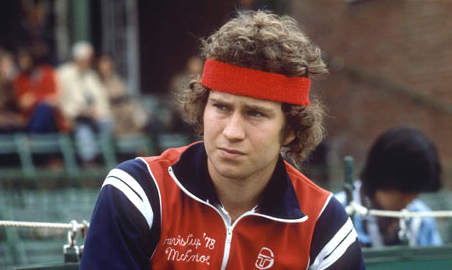 Invented the classic 70s tennis look aped by college kids at Halloween for decades now. 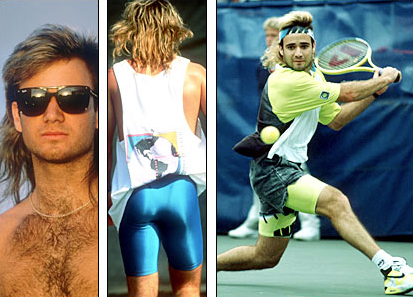 McEnroe could be scary on court but not as scary as his fashion sense. The obvious crime here is the hat but the eagle shirt edges it on closer inspection. He saved himself sunburn on his neck, so we’ll let him off – but not for the shirt. 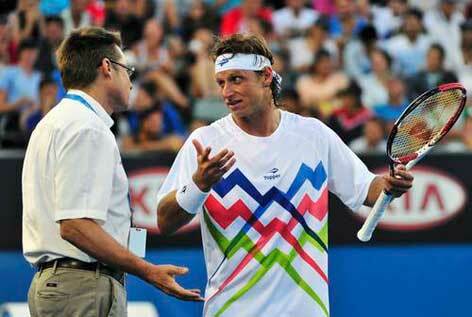 Stefan had the unfortunate luck of being a champion in the 80s otherwise he’s quite a stylish dresser now. 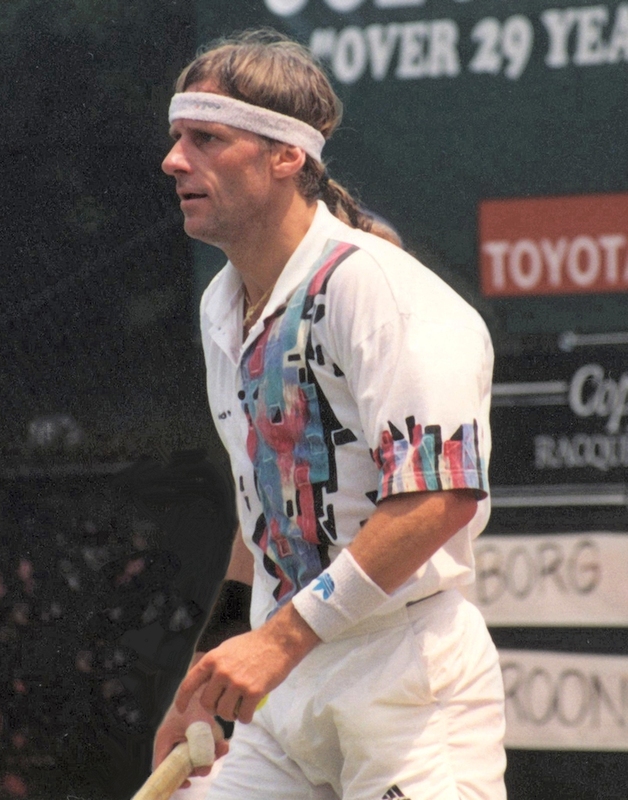 The tennis shirt tucked into stonewashed jeans with accompanying mullet haircut is fairly unforgivable – unless you’re being kissed while holding the Wimbledon trophy in your hands. David liked his bright colors especially hot yellows and oranges but it’s this shirt that has flagged him up for inspection. 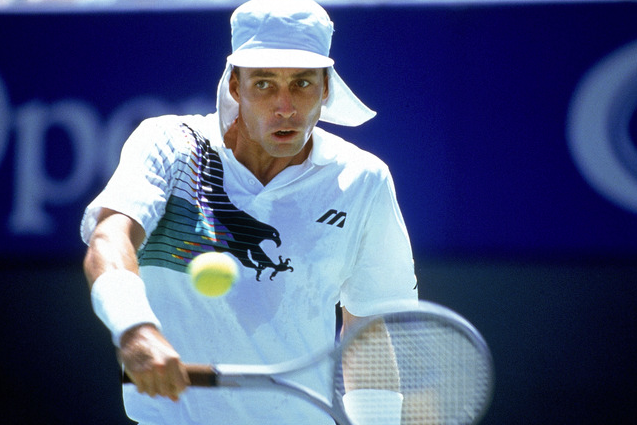 It’s something Edberg might have enjoyed in 1988 but the hot colors also did nothing for David’s attitude as his kicked a line judge while wearing it. 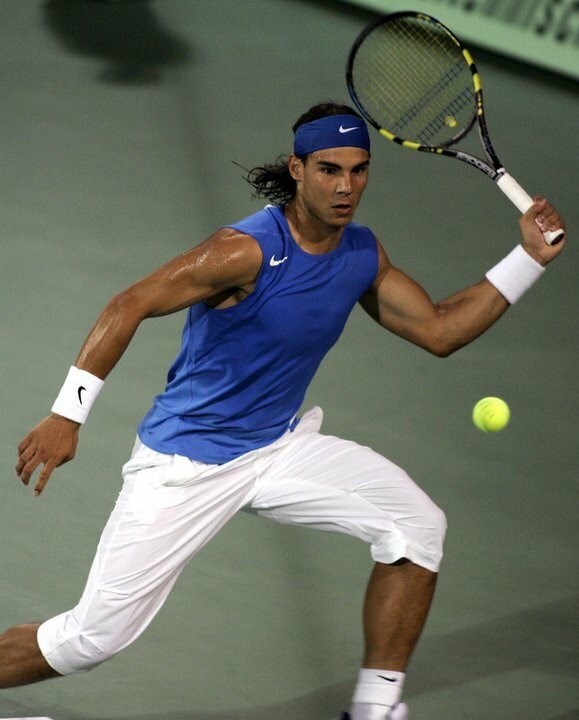 Every young tennis player was copying Rafa’s ‘Pirata’ look in the mid-2000s, but even Rafa realized he needed to jettison the pants and cover his guns a bit. Still, we’ve seen worse. It’s ironic that Bjorn owns a fashion line because on this evidence he should not have been let near it. This must have been a confusing time for Bjorn during his comeback because he still wanted to use a wooden racket and clearly some of his 70s getup. 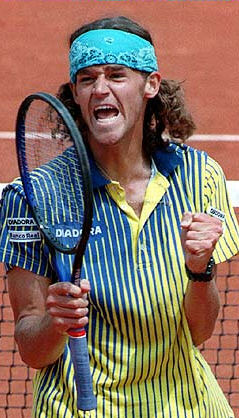 If you win 3 French Open titles then you earn some protection from the fashion police but despite pulling off blue and yellow, the hair and headband combination just doesn’t tie it all together. Where’s Tim Gunn when you need him?